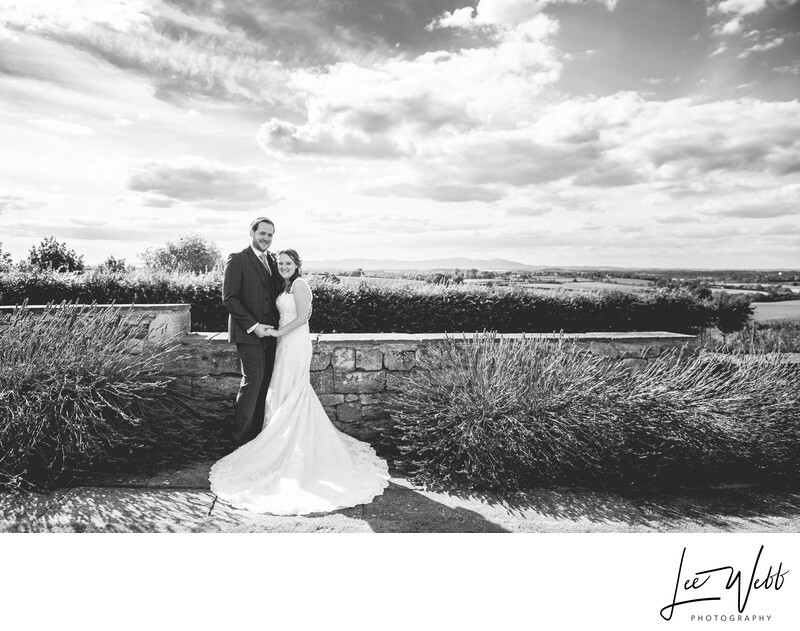 Jacky and Malc got married at, and had their wedding reception at Deer Park Hall in Worcestershire. Their theme for the wedding was one that I had not seen before - clouds. This photo was taken at the front of Deer Park, looking South West towards the Malvern Hills some 19km away. I used a graduated filter to help darken the clouds, and the conversion to black and white heightens the effect more. I love the position of the bride and groom in this photo. The way they're standing shows an innate closeness between them, whilst also allowing Jacky to fully show off her amazing wedding dress at the same time. I also really like the texture that the lavender plants give this image in black and white, and how well the spikiness contrasts the soft fluffy clouds. This is one of the first venues I worked at, and I am proud to be a recommended supplier at Deer Park Hall, of which I have been for more than 5 years. To view the Deer Park Hall weddings website click here.